If were to put the words "Modus Operandi" and "IPA" together in a sentence, logic would tend to send you towards either of their pair of multi award-winning American IPAs, Former Tenant and Zoo Feeder. 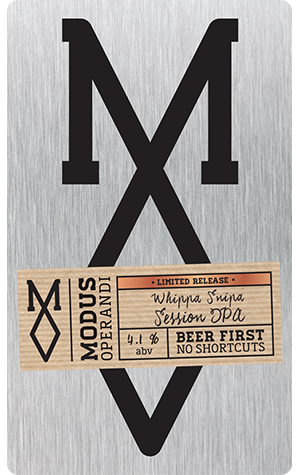 But for something a little different and a little subtler, they’ve released a session IPA. For non-Aussies, Whippa Snipa is a local colloquialism for a weed whacker / weed eater and its inference here is of being a lawnmower beer, which is to say one you’ll be craving once you’re done mowing the lawns on a hot day. They can be a tricky thing to get right, these small beers that attempt not to compromise on big flavour. Sacrificing a bit of alcohol tends to mean there’s a bit less body to work with, but here they’ve balanced everything with grace. Three US hops varieties, Simcoe, Citra and Chinook, create a beer with ample aromas and flavours of melon and citrus fruit while the lengthy bitterness feels dry rather than bracing. At 4.1 percent ABV it’s not quite in the official realms of mid-strength but it’s certainly not far off and it still packs in more than plenty of beers bigger in size. Whippa Snipa is a tap only release but you can’t help but hope they’ll look to package this baby up once the warmer months come calling.